As you may know already we are big Micro Scooter fans in this house. 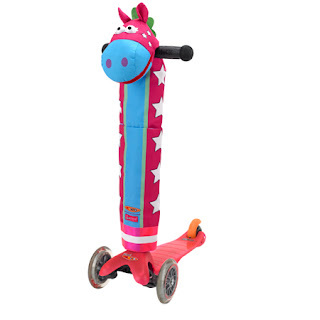 The 3 year old has been zipping about on his Mini Micro since the start of the Summer, ignoring the death stares of his brother and sister with impressive indifference. 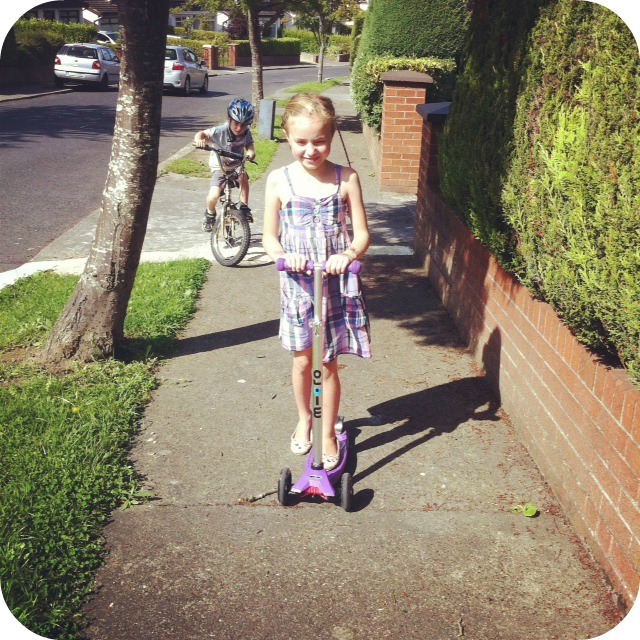 In fact this Summer has been a huge turning point for family life in general. The children have finally found friends of their own age in the estate and can't wait to get out the front door every morning to go and play. It's not unusual to open my bleary eyes at 7am to see the 5 year old standing in front of me fully dressed with his helmet on asking if he can go biking with Tom now. The only flurry of rain on this parade is the fact that despite the 8 year old's best endeavors, and the fact that her little brothers can get from driveway to end of road in 0.6 seconds on theirs bikes, she still hasn't mastered the art of cycling. Micro Scooters - What's the big deal? Micro Scooters have become such a massive hit around the world that it is hard not to spot them as you go about your daily business. But at over £90 (€120) they don't come cheap. So are they worth it? Well, in my humble opinion they really are. We had many years of cheap scooters that lay unused after the first week of ownership due to the noise, the falls, and the general hard work of the ride. Micro Scooters are the Rolls Royce of scooters. 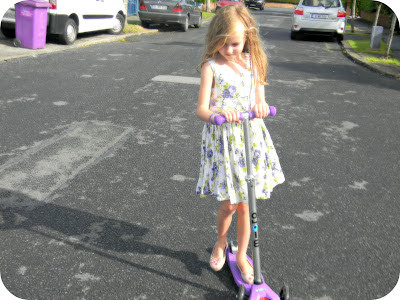 Gliding perfectly and zig zagging around obstacles like a skateboard does. It takes seconds for the kids to master it. They are robust, fun and very ascetically pleasing. And did I mention their range of colours and accessories? Although you wouldn't be buying one in every colour they do make perfect special birthday or Christmas presents. If you're still trying to justify the cost then how about this - all the parts are replaceable so when your eldest daughter grows out of her purple one you can simply buy the separate parts in blue for her little brother - and voila - a brand new scooter is born. Micro Scooters have two new products launching in the next few weeks and I've been allowed to give you all a sneak preview. 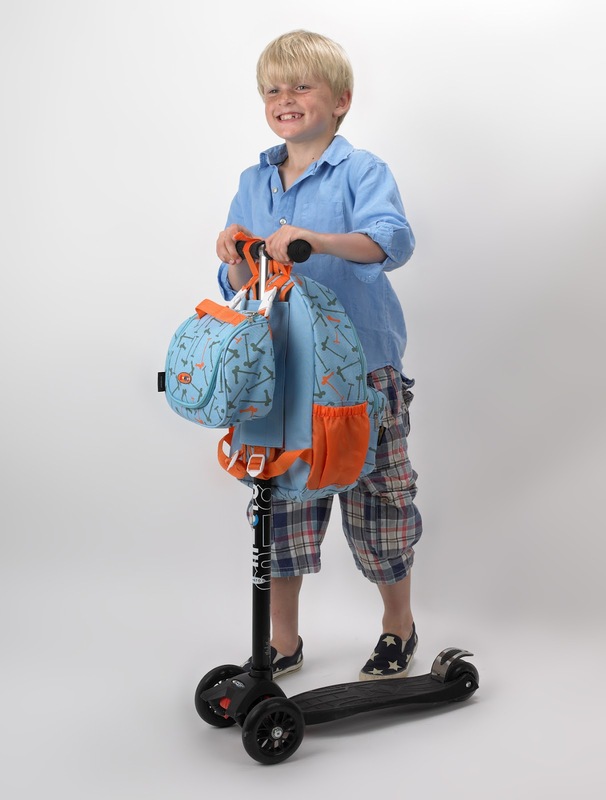 First up is the Maxi Backpack which hooks on to the Maxi Scooter, RRP is £29.99 and comes with the detachable lunchbox as seen here. Perfect for back to school! Disclosure: The Maxi Micro Scooter was provided to me for the purposes of the review. Words, video and opinions are my own.